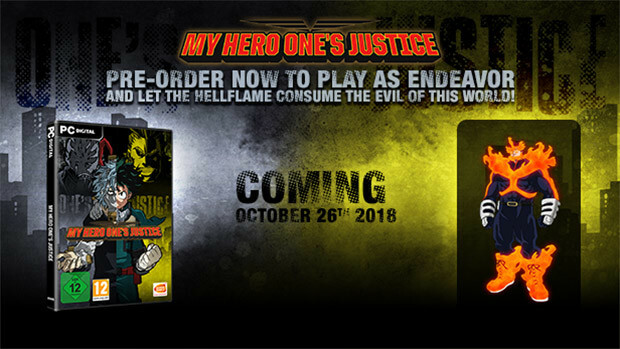 Fight for justice in the upcoming brawler My Hero's One Justice which is launching on October 26th. Get a look at the action with over 20 minutes of New Gameplay Footage while you wait. Suit up and prepare to dish out some justice when My Hero's One Justice launches later this week. While you wait you can feast your eyes on over 20 minutes of new gameplay footage from IGN as they battle their way through the Todoroki Arcade Mode by taking on various challengers from the game. We've also got a fresh look at the Story Mode for the game with the first 15 minutes (spoilers ahead) which focuses on the Stain Arc from the show. Like the anime series, the game has a very faithful comic book art style for the game cutscenes which makes it feel like the action is leaping directly off the pages! My Hero One's Justice launches on October 26th, pre-order your copy to save 10% off and get the playable character Endeavor for free!